Hoffman's story is amazingly detailed, especially his descriptions of Toyland. I read aloud the lengthy story in two 15 minute sittings with my preschool daughter. She happily perused the vivid and rich illustrations by Gail de Marcken while listening to the descriptions in the text and especially enjoyed the Toyland filled with sugary treats and a Marzipan castle. She wasn't sure what to make of the seven-headed Mouse King or the poor Princess Pirlipat who was turned into an ugly doll. All those who enjoy the Nutcracker Ballet should read the actual story at least once in their lifetime. It's a superb holiday read! Christmas is a magical time a year, with dancing, falling snow, smiling faces, sparkling lights and brisk temperatures causing frosty breaths. Even Santa Claus is not immune to the wonders of the season. He feels the magic in his whiskers long before his magical flight on Christmas Eve. 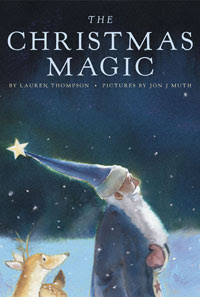 Bestselling author Lauren Thompson poetically describes Santa's preparations and the magic of his journey in her newest book, The Christmas Magic. There's so much to do and Santa, in his bunny slippers, gets to work by trimming his beard, feeding the reindeer, polishing the sleigh bells and checking the big book of children's names. Finally, the magical night arrives and Santa sets off flying up into the glorious, bluish, snow-filled sky. Jon J. Muth brings out the minimalist in Santa Claus in his watercolor and pastel illustrations. Santa's sparse surroundings include only a small house and barn for his reindeer. Readers won't find elves, Mrs. Santa Claus or any of the typical North Pole hustle and bustle in this quiet, reflective book. Just Santa Claus alone with his reindeer and a cat. The book provides young readers an unusual, alternate glimpse into the life of Santa Claus. The simplicity of it all is striking and, well, downright magical. Thanks to Scholastic and Big Honcho Media, Brimful Curiosities' readers can enter to win the books. Every year I fill our coffee table with Christmas stories to read to my boys. These would be a wonderful addition to our collection. I do not have either of these. It's time to introduce my grandkids to the Nutcracker. I can't wait to read these books to the kids. I adore the Nutcracker. I'd love to read it to my class. I love that Santa has bunny slippers! And both of the covers are beautiful, I'm sure the inside illustrations are wonderful. Thanks! Every home needs a copy of the Nutcracker. It is classic! And, it makes it so much more worth while when you go to see the ballet to already know the story! I'd love to share these with my daughter! When I was little my grandma took me to the Nutcracker play and I loved it. I'd love to read these to my sons. I so love Christmas book at Christmas time. My niece is dancing in the Nutcracker this month and I'd love to win this to give the book to her for Christmas. Thanks for the giveaway! We only have 1 Christmas book and I'd love to add to our collection! My daughter had been watching the Princessa Nutcracker DVD and I think she'd love to see the whole story. Oh, what beautiful books. I love the Nutcracker story, and The Christmas Magic looks wonderful. I love the quote you posted. 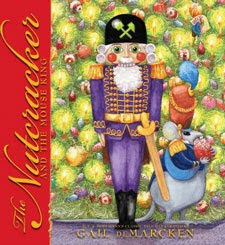 My son's class is doing a little dance to the nutcracker, I would love to share this book with him. Thanks! These are books that I would love to share with my grandson and start a tradition of reading these each year to help share the magic of Christmas. I follow you and subscribe by email and Google Reader. My granddaughter has been to a Nutcracker production and loved it. She would really like this book. this would be the perfect gift for my son! I would love to win these books for my daughter! I would like to start introducing her to the Nutcracker and look forward to taking her to see the live performance when she is older. These look so beautiful! I always saw the Nutcracker every year as a kid! My niece is dancing the part of the Snow Queen this year in The Nutcracker. I'm so proud of her! I'd love to give her this book to in honor of her senior year performance! I would love these for my children. My daughter and I went to see the Nutcracker and she loved it. These would be great books to read to my kids. These would be wonderful books to read with my little ones! I've never read the actual Nutcracker before either, and I didn't realize many of the details you mentioned. 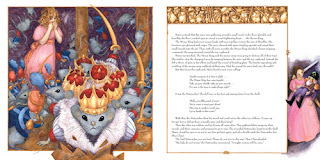 I had no idea the mouse king had 7 heads either! But the illustrations look amazing. They both sound like great books! Every day before quiet time I read to my daycare kids. I like to be able to read to them books pertaining to holidays that are approaching and I would love to add these to our collection. I think the older kids would really enjoy them. I love holiday books! Right now we are reading Thanks for Thanksgiving and we love it! I have a small collection of Christmas books and would love to add to it. (Our current fav is Mortimer's Christmas Manger). I saw the Nutcracker Ballet as a child and I loved it! We also own the Barbie DVD you mentioned, and hope to take our toddler in the coming years! We read a new holiday book together every Christmas Eve- last year it was Polar Express! i think my son would enjoy me reading these books to him duting the holiday season! I can't believe Christmas is around the corner -- I need to get some nice Christmas picture books for the holidays. These look amazing! I would love to share these with my children! Please include me in the contest! Christmas is my favorite holiday and reading is my favorite hobby. How fun it would be to win these books to combine the two! Both books look great, but I am really looking forward to sharing The Christmas Magic with my children. The illustrations by Jon J. Muth are beautiful. I love the theme of simplicity amidst all the modern Christmas craziness. My daughter's next "theme" in school is Nutcracker - perfect timing! thanks for the button to make it easy peasey! My daughter would love these books! We haven't been to The Nutcracker, but I know she'd be mesmerized. +1 I follow on Blogger. My mom collects Nutcrackers so my kids are interested in the story. My 5 year old liked the Prima Princessa Nutcracker DVD and we have a higher level picture book, but I would love to see if these versions don't go "over their heads". I'm looking for more Christmas books for my daughter, and these look beautiful! I would love to win those books! We are thinking of going to see Nutcracker too this year. Both sound like wonderful titles! My Granddaughter has Barbie and the Nutcracker, and I would love her to have a book to read about it as well . If I was the lucky winner of these lovely books; I would share them with my preschool class! I love giving my grandchildren books for Christmas. These would be perfect.